ARM Holdings has posted better-than-expected results for its second quarter and half year ended June 30, 2011. The British giant, whose processor designs are used by Samsung Electronics, Qualcomm and Texas Instruments, says it signed 29 new licensing agreements during the second quarter of 2011, helping push the company's pre-tax profit to £54.2 million ($88.3 million) on 18% higher revenue of £117.8 million ($190.3 million). During this period 1.1 billion ARM chips were shipped in mobile phones and tablets and another 800 million in a range of consumer and embedded digital devices. 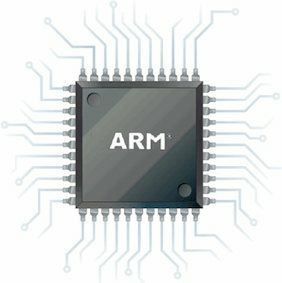 Although ARM itself doesn't make the chips, its designs are used in most smartphones and tablets available today, including Apple's iPhone or Samsung's Galaxy line. These figures show just how big the mobile and embedded market is and why Intel wants so badly to gain a stronger foothold here. But the company is still cautious about the rest of the year, with its predictions for the whole year unchanged. "There's obviously a number of broad macro economic uncertainties that make us cautious as to whether the normal seasonal uptick you see at the end of the year, ahead of Christmas, is as significant as it had been in some other years," said Tim Score, the group's finance director, according to U.K.'s Telegraph. Score also commented on ARM's move into the lucrative PC and server space, both of which are currently dominated by x86 architecture, suggesting the industry is poised to experience a paradigm shift.